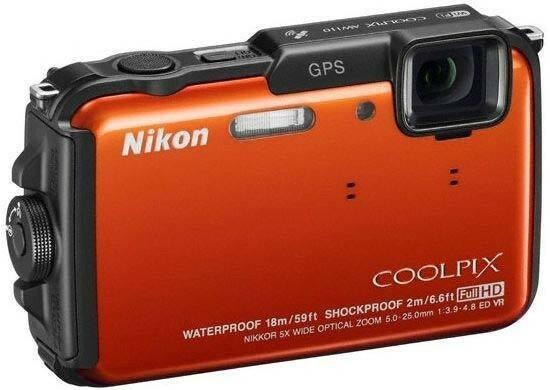 The Nikon Coolpix AW110 is a part of an already saturated market of tough cameras designed to be taken anywhere. These days, you have to do something better to get the attention of the roving consumer eyes. So Nikon seem to have gone to town on the AW110 and added all sorts of little gizmos to make it irresistible to the extreme traveller. For example, in the past, these extreme cameras would simply have waterproofing and shock-proofing. Now, we have wifi, GPS, improved depth of waterproofing, higher drop tolerance and on the AW110 an Altimeter to measure how high above sea level you are. Nikon have increased the durability of the AW110 making it go deeper and be dropped from higher. The design is still typical of most tough cameras with the thick plastic and while it will play it's part in keeping the precious internal workings safe, there's a few cameras out there that don't have it and we can't help think that it's a bit of show. Image quality is a big improvement on previous Nikon offerings, but they're still not there yet. Noise performance is a big improvement. Colours are vibrant and the sharpness is great. Drill down into the photographs and noise is evident at mid-range settings which is a mild improvement on previous Nikon digital compact cameras. So what we're seeing in the Nikon Coolpix AW110 is a welcome return to quality imaging from one of the best known and most trusted brands in the photographic industry. The AW110 certainly seems like a step in the right direction and used properly, the pictures that it produces look lovely. If you're into your extreme sports and also enjoy cataloguing all your activities, then the Nikon Coolpix AW110 deals with everything from where you are to how high or low you are by adding a new dimension with the altimeter. With the aforementioned improvement in image quality and the added durability, this is a serious contender. You should take a look at the new Nikon Coolpix AW110.